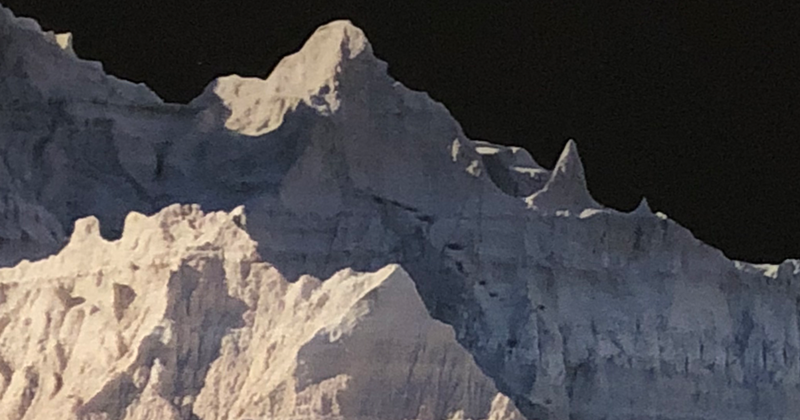 The current MAEP Exhibition at Mia presents landscape photography that celebrates both the uncanny and the physicality of the medium, through October 28. Over this past summer and now early fall, the MAEP galleries at Mia have brought forth an eye-tricking experience. Through a myriad of highly complex photographs, Beth Dow’s Prediction Error presents ways in which our bias towards what we know can be altered or untrue through our perception of a certain stimuli, in this case both landscapes and still lifes. 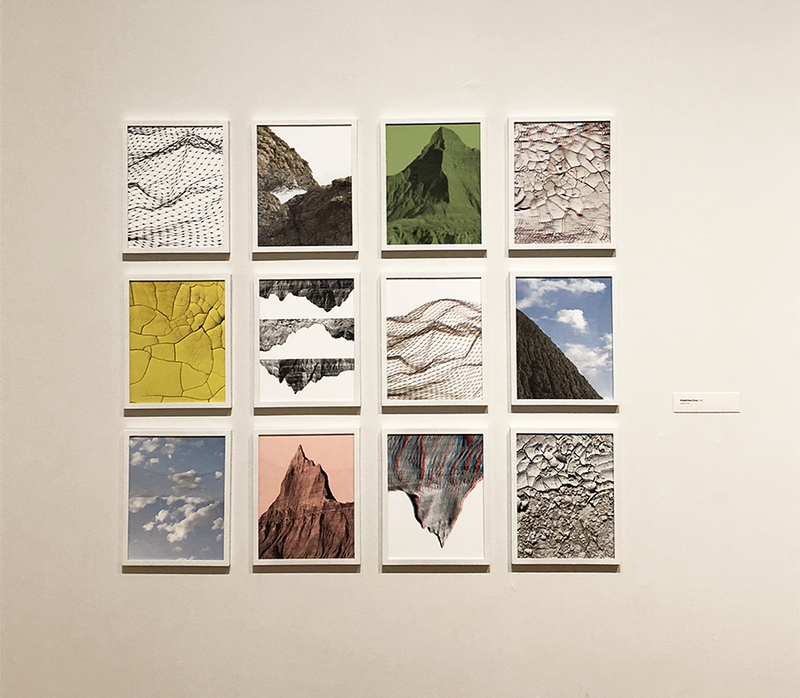 The complicated notion of the multi-faceted in what we see and understand is laid out almost scientifically through Dow’s work here, for instance in her series of prints in “The Valley.” Viewers not only see what the photograph intends to show — details of a mountainous topography — but can also see the qualities of the photograph as its own entity. 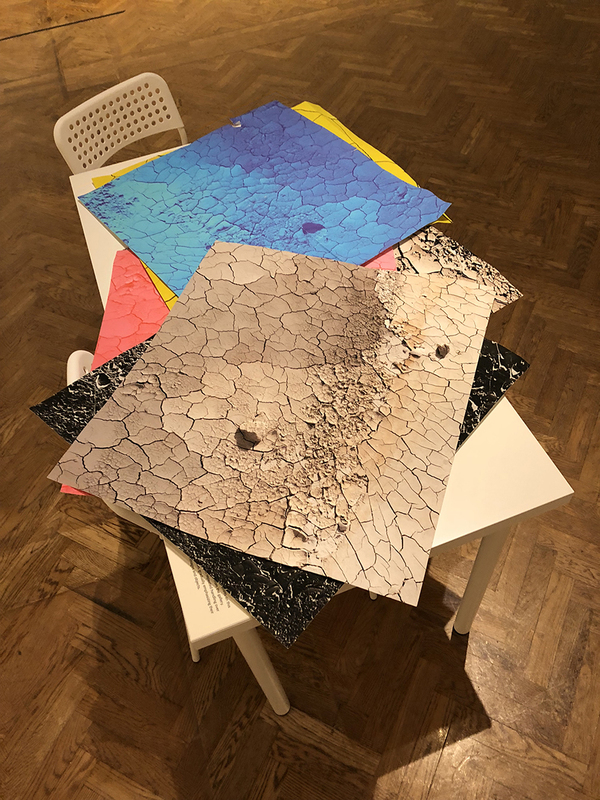 This physicality of the photograph continues in Dow’s placement of a table with several of her prints in the center of the first MAEP gallery, where viewers may sit down and actually touch and play with the works they see around them. Prediction Error is an exciting speculation into the history and personality of photography, as well as a fresh reminder that everything requires more than one glance or perspective. Installation in the front gallery. Viewers are invited to inspect and rearrange the photos in any way they wish. John Herbert: Acknowledging that your father, Ron Dow, is included in the first gallery of your show, did his work as a photographer inspire you to become one yourself, or did you come to photography from a different path? Beth Dow: I loved it, and watching images appear by magic in the developer tray is one of my earliest memories, but I resisted photography for myself. My first medium was drawing, and I was quite obsessive about it. In fact my first foray into lens-based artmaking was based on drawing. My dad mounted clear scraps of film into slide frames for me. I sat on a stool at his light table and drew my own slides with a Sharpie, then we projected them. I’ve always had a rather expansive idea about the nature of photography. JH: How do you mean? BD: Even as a small child, I never thought photographs had to be two-dimensional or made with a camera. More importantly, I understood them as constructs. JH: I know that you are multifaceted in both analog and digital photography. 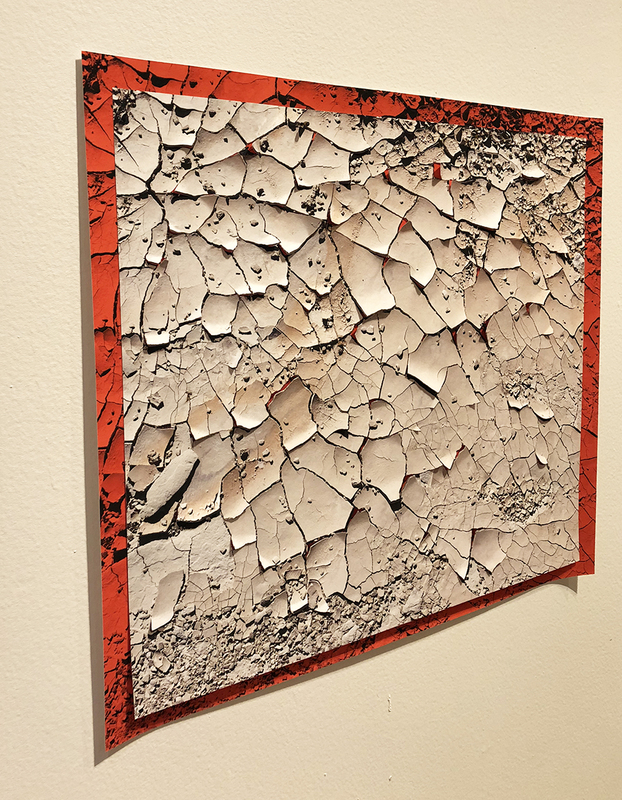 What lead to the decision of having your work in Prediction Error be solely comprised of digital prints? BD: I had intended to have several photographic mediums represented in this exhibition, along with some drawings, but in the end I let the work tell me what it wanted to be. I always trust the opinion of the work. JH: Had you been to the Badlands prior to this project? Additionally, if the Badlands had not been available to you for this project, where would you choose to go instead? 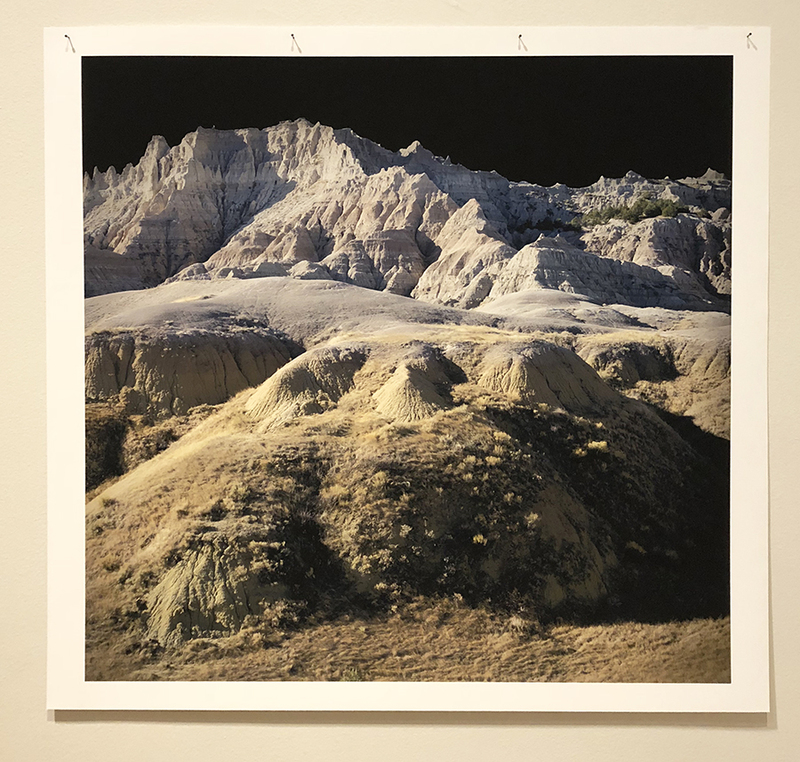 BD: I had been to the Badlands many times, and used that histogram-shaped landscape as the source material for my project The Dynamic Range, which referenced how we use photography to explore and depict the terrains of space. The moon-like landscape of Timanfaya National Park on Lanzarote (one of the Canary Islands) would be a great way to take this further. I nearly went there many years ago but ended up on a beach on the neighboring island of Fuerteventura. The moon still calls to me. JH: Is there a basis behind why “The Valley” is composed of desert landscapes? What was the deciding factor, if any, to what you photographed? BD: I’m completely enchanted with the landscape of the Badlands, and of course the place name alone is pure poetry. I wanted a terrain that linked earth with other bodies spinning through space because I didn’t want it to feel completely familiar. I was looking for that sly tension between beauty and the eerie, unsettled sense of the uncanny. JH: With events like the Thai cave rescue in the world's recent memory, how do you think natural disasters inform or alter our perception of the environment? BD: We have a persistent mistrust of the natural world, which is perhaps why we work so hard to dominate it. Humans and nature love each other all the while we try to do each other in. 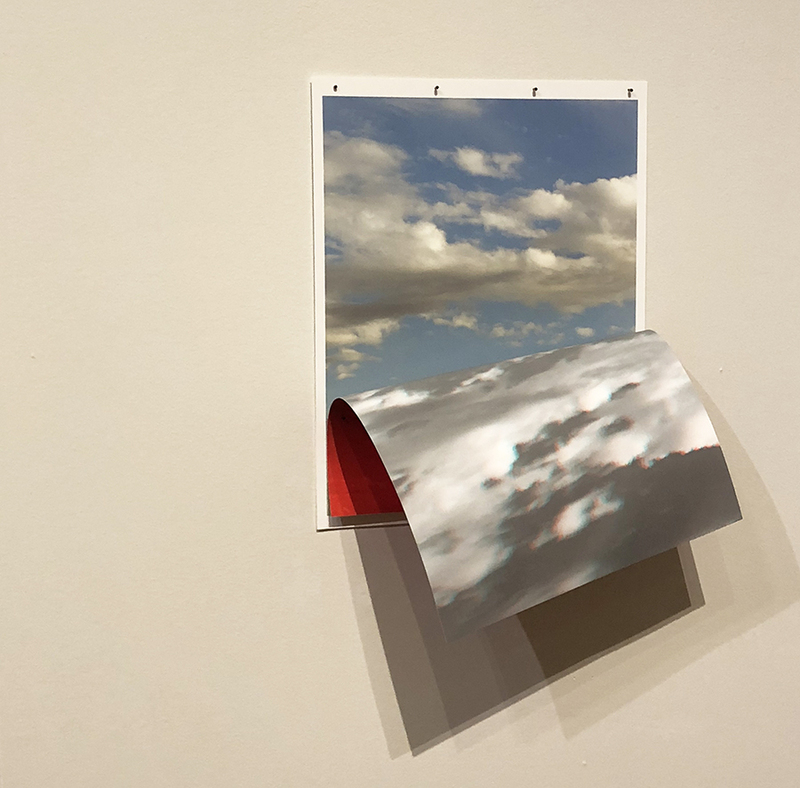 JH: Viewing your work in Prediction Error is an introspective experience on two accounts; how the viewer has previously engaged with nature and how the viewer engages with their own biases of what they know to be "known”. I am wondering if this was intentional on your part for the viewer experience. BD: This is such an interesting observation. I titled the two vintage cibachromes by my dad as Stored Objects to refer to the way we gather and store our experiences of the material world, and how that store of experience partners with incoming visual data to make predictions about the nature of what we observe. JH: What was your process in creating the prints for Prediction Error? BD: I was thinking about photography as a metaphor for perception. I tried to use basic ways we process and depict color, dimension, and texture in photography to model the way we try to make sense of what we see. Prediction Error is on view in the U.S. Bank Gallery at Mia through October 28th. General admission is free, and the museum is open Tuesday/Wednesday/Saturday: 10am-5pm, Thursday/Friday: 10am-9pm, and Sunday: 11am-5pm.